Atiku Abubakar, Nigerian presidential contender arrives in DC to meet U.S. officials, business reps & Nigerians, accompanied by Senate President Bukola Saraki and delegation of aides. Atiku Abubakar, the presidential candidate of the Peoples Democratic Party (PDP), will arrive the United States any moment from now, crossing one of the most serious political hurdles on his path ahead of the upcoming general elections. Campaign sources told PREMIUM TIMES Thursday evening that Mr Abubakar would be speaking at a forum by the American Chamber of Commerce in Washington D.C. and attend other meetings aimed at boosting his presidential election standing. Mr Abubakar's arrival in the U.S. may rattle the ruling All Progressives Congress, which has taunted him for his inability to enter the U.S. for over a decade. Mr Abubakar has not visited the U.S. since 2007 when he left as Nigeria's vice-president. He served under former President Olusegun Obasanjo. For the over 12 years that Mr Abubakar was unable to visit the U.S. American authorities had declined to issue him entry visa and there were speculation that a secret indictment had been entered against him by that country's authorities. PREMIUM TIMES reported last year that Mr Abubakar sold his estate in the United States, following his inability to enter the country. He denied that his inability to enter the U.S. informed the sale, saying he only sold the mansion because he no longer needed it as he was now fully based in Nigeria. Mr Abubakar's visa appears to have come through the intervention of Mr Obasanjo, with whom he recently settled decade-old dispute ahead of the 2019 elections. Party insiders told PREMIUM TIMES U.S. authorities made it clear that Mr Abubakar was issued visa without preconditions, meaning he would not be detained or harrassed in any way if he entered the country. 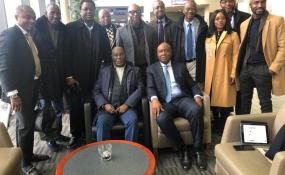 Atiku Confirms Arrival in U.S.